When we think of giving or receiving roses, we often think of love and adoration ... and if we are really in tune with the deeper aspect of color, we also consider the color of the rose and what that color symbolizes. For instance, if you receive a single red rose or a bouquet of red roses, you'll often think of romantic love. Yellow roses would put us in the mind of a "friendship love" while white roses might symbolize purity, marriage and new beginnings. Color symbology is not some clever concept some random person thought up while sitting around bored, but colors truly do have energies or vibrations if you open yourself up to them! Not only do color frequencies and energy resonate through the gesture of giving roses, but color energy resonates through all things! Ever feel a certain way, but have no clue as to why? This could have a whole lot to do with the colors around you or on your body -your attire. Have you ever noticed that wearing certain colors inspire your mood in some way? For instance, if you wore a bright and beautiful shade of yellow it more than like would lift your mood and might even make you cheery. It might be kinda hard (in general) for you to feel melancholy while adorned in such a high vibratory color. Now wearing black, on the other hand, might inspire you to feel removed from an environment and protected in a sense. You might even wear black if you wear feeling melancholy, as to conceal your emotions. 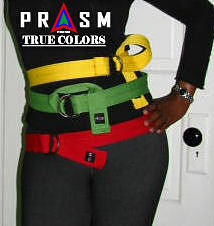 Colors mean everything and this is why PRASM's focus is color based! We are not simply interested in trying to set trends and styles, but we have a love for using our products to change lives and lift spirits! Why not make getting dressed everyday even more meaningful?! The best thing about the PRASM belt and sock collection is that those color frequencies work in the same way as with anything else, but the difference is that you don't have to spend much time deciding how you can use color to your advantage. No! You just simply throw on whatever color-style belt or socks move you for the day and you allow those color energies to get you going! So perhaps you don't want to leave the house in an orange shirt (or pants), but you want to add a touch of orange at the waste and on your feet. Well you can do this easily with an orange belt or socks. Orange promotes energy, intellect, creativity, endurance, vitality, emotional balance and so much more! If you've never entertained color symbolism, then give it a try while paying attention to the way colors affect your psyche and your energy level! Need to get your passion up for an event, a person, a project... wear red. Red promotes courage, passion, strength, power, determination, recognition, respect, physical energy and more. And it doesn't matter how much of a color you're rocking ... it can be just an accent of red and it'll still serve the same purpose. Red nail polish would also serve the same purpose! So would a PRASM belt or socks! It doesn't take much. Have to give a speech or do you need to have a serious conversation with someone? Feeling uneasy, unbalanced or unsettled? Wearing the color blue brings out good communication, peace, tranquility, calmness, and balance. Blue also promotes truth, loyalty, an active intuition, stability, hope, faith, an open mind and so much more! Open yourself up to color energies and become aware of that which you are attracting to yourself. Don't underestimate the power of color! In the next post, I will cover all the colors in a list or chart form! In the meantime, you could research some of the metaphysical color properties on your own! It's fun... really it is! Turn the simple things in life, like getting dressed, into something with a deeper, more meaningful purpose! To find our PRASM collection, please visit our website here!